The dancing bear shooting from cover. In an odd occurrence of synchronicity, I read this commentary on dancing bears then was tapped to be one. If you don’t have time to check out the link: Dancing bears are special not because they dance well, but because they dance at all. And women are the “dancing bears” of the gun world. I went to the range after work yesterday to practice, which I do most weeks. I chatted with several of the guys that work there. It’s part of the experience for me. I take the time to build relationships with people I see often. A news crew appeared and interviewed the owner, then one of the staff members I speak to frequently. The shooting at Sandy Hook Elementary School earlier this week in Newtown, CT prompted the visit. I’m relieved that nothing I said was taken out of context and I don’t think I’ll volunteer for a video interview again. I intend to take a Range Safety officer class after the first of the year so I can be safer, network, and find a way to attend matches and cut my cost. And maybe I can enable another dancing bear along the path to knowledge, experience, and the satisfaction that comes with self improvement. I have had a few people ask about getting a Concealed Handgun Permit or Concealed Carry Weapon (CCW) License. Why might you consider this? It gives you more options for carrying guns legally and you don’t have to apply for a Pistol Purchase Permit every time you want to purchase a handgun. You are not required to carry if you have a permit, but you have the option. NOTE: I’m not a lawyer or a law enforcement official. I’m sharing my experience but follow my advice at your own risk. Do your own research then decide what’s right for you. In the state of North Carolina, you must attend an 8 hour class and pass a shooting proficiency test to apply for your permit. I was under the impression that the 8 hour class would teach tactics or basic self defense skills. I was wrong. This class is designed to present you with basic gun safety, familiarize you with the laws concerning where you can carry and to discuss justified use of deadly force. This is nothing more than a way for the state to ensure everyone with a carry permit has been exposed to the law and to basic gun safety. I took a class offered by the Wake County Range. The current class schedule is here. The cost was $80. The time commitment was just under 10 hours if you include the round trip drive to the range. Part of what they discuss is how to apply for the permit, what it costs and how long it takes. To get your certificate, you must pass a written test and a shooting proficiency test. The written test is 50 questions which are multiple choice, true/false, or fill in the blank. The shooting proficiency test requires you to fire 10 rounds each at distances of 3, 5, and 7 yards at a standard silhouette target. 70% is considered a passing score for both exams. You will need to bring a handgun and a minimum of 50 rounds of ammunition (you may want to bring extra ammunition in case you have any issues with your handgun during the qualification course of fire). If you have an extra magazine for your pistol, or a speed loader for your revolver, please bring it. If you do not have a handgun, please let me know and I’ll arrange with the instructors for you to use one of their guns for a small fee. NOTE: This is not the time to learn how to operate a firearm or a firearm that is new to you. Spend some time getting familiar with the gun and how it functions before you take this class. Read the owner’s manual. 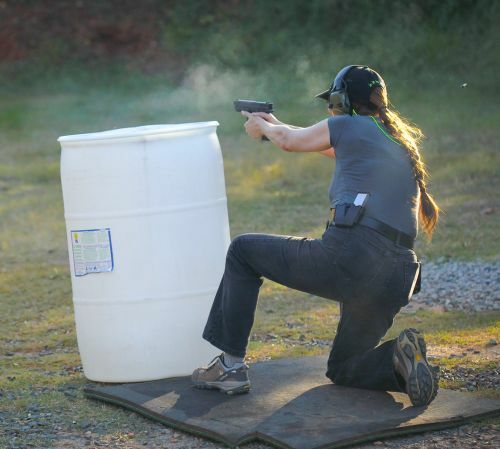 There are many options for CCW (Concealed Carry Weapon) classes locally. Just be sure that the class you choose meets the 8 hour minimum and is licensed to issue a state recognized course certificate. Type “<your city> handgun training” into Google and you should find multiple options. Ask at the range where you practice. They can make referrals. Once you have your class certificate, here’s the scoop on applying in Wake County, NC. They are only open during regular business hours during the week. You may have to take time off work to visit the courthouse. Download the forms, review them, and fill them out before you drive to the courthouse. My class instructor recommended making a copy of the class certificate to keep for your records. The cost of $90 includes a $10 fee for being fingerprinted. The fingerprint office is right next door to the handgun permit office but they are not open from 11am to 1pm. So come earlier or later. They don’t take credit cards. So bring enough cash or a check. My permit took 6 weeks to be processed. They can take as long as 90 days in NC. Total cost: $170 (class and permit application) + 8 hours of class + 50 rounds of ammunition + 1 or 2 trips to the courthouse. Finger printed? Yes, you will be fingerprinted. That was the thing I was concerned about the most since I’ve never been fingerprinted. It made me feel as if I was throwing myself on the mercy of our judicial system and that felt scary to me. They are digital prints and I’m told that isn’t as precise as paper and ink. But you will be in the system. Since I have no aspirations toward a life of crime, I decided it was just one more thing I’d have to accept as part of paying my “gun dues”. This can be a mental journey as well as a physical one: think hard about the privacy tradeoffs. This “feature” made available by WRAL ignited quite a bit of press about invasion of privacy: Rural areas lead in concealed weapons permit rates. You can enter any local street name and it will tell you how many permit holders live on the street. My street has four, but there are 90+ residences on the street. On streets with just a few houses, it can make it easy for the neighbors to know who carries. That can make you a target for theft. The link has been up for months and WRAL refuses to take it down. [Note: the original video was deleted so I’ve added a link to a different video as of March 2016]. More of Gunhilda’s wisdom can be found here. I highly recommend Kathy Jackson’s book for all new shooters, male or female. XD9 and 1911 width comparison. I bought a 1911 recently. I decided not to shoot it until I replaced the grips and was able to slim down the gun. I picked up the new gun with the new grips on Tuesday November 20th, 2012. I’m still focused on learning to maintain my grip through multiple shots and I was hoping this gun would make it easier for me to do that. It did! I managed to keep my hands on the gun, in the same exact position for more than one shot. It’s going to take practice, focus, and work to improve my hand strength but If I can do it once I know I can do it again. 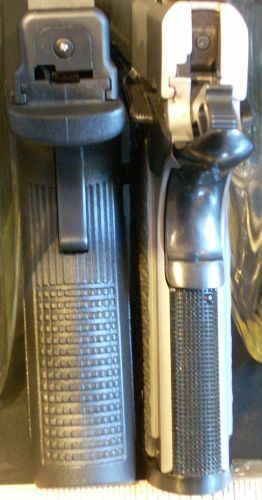 The 1911 is a thin frame with a single stack magazine. The grips can be swapped out to slim down or add width to fit the shooter’s hand. The advice I followed insisted that a 1911 was the best choice for my small hands. I can now feel the difference that makes. I asked the gunsmith that swapped the grips for me to measure the width of both guns, The difference is .23 or almost a 1/4 inch. That difference makes it easier for me to keep the thumb of my strong hand pointing forward. With a wider gun I tend to twist my hand toward the trigger side to ensure I could reach the trigger. 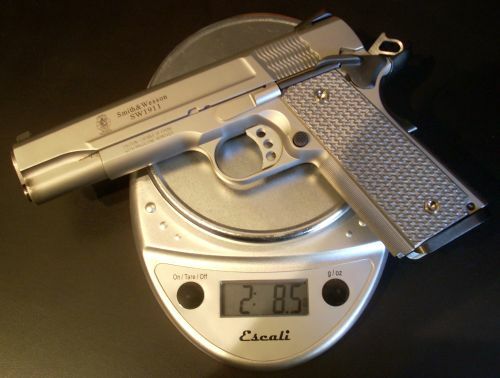 The 1911 is heavier too, so there is less recoil. This may be doing more to stabilize my grip then the reduced width. I weighed the 1911 and the XD9 I’ve been shooting. 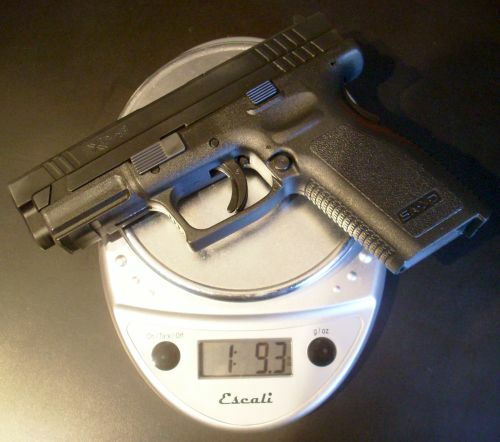 Using a kitchen scale and unloaded guns (no magazine), I found the 1911 to be almost a pound heavier (15.2 oz). I can tell the gun isn’t moving as much when I shoot and that is definitely giving me more control. To focus on my grip and include target transition, I shot steel plates. Knock them down, set them back up. Over and over. 10 plates, 10 round magazines and 124 rounds means just over dozen times resetting the plates. When I missed a plate it was usually because I slapped the trigger. So the next shot I focused once again on proper grip, a tight supporting hand, relaxing the dominant hand, then gently squeezing the trigger. The more I practice this “transition” from “I missed….” to “relax and focus” the better I’ll be able to recover in a stressful situation. -The trigger is scary light for me. I’m having trouble finding the trigger reset because there is very, very little back travel to reach it. -I need to practice with the safety. I managed to nudge it on while shooting and then had to stop to trouble shoot why the gun stopped firing. The XD9 has a grip safety and nothing to flip up/down. This is a new process to add to my draw. -The magazine is a tight fit and in one case I failed to insert it far enough. Once again I stopped to trouble shoot the issue. In this case I felt foolish as I had not gone through the “click, tug, press, battery” check list I learned in my recent defensive handgun class. Roughly a week later I was back at the range and once again focused on my grip. This trip I got a lane and shot paper. – I hate to admit it, but I had an accidental discharge (pointing downrange) because the trigger is so light. It was a scary reminder of one of the 4 IDPA safety rules: Keep your finger off the trigger until you are ready to shoot. – I’m still nudging the safety up while shooting. At least now I know why the gun just stopped shooting and can work to stop this from happening. – I was able to shoot almost an entire magazine with no shift in my grip. That’s progress! – Since I was unable to work on target transition in a lane, I started working on keeping both eyes open while I shoot. Since my focus is defensive scenarios, that is yet another skill I need to work on.